Which President was responsible for bringing about Mother�s Day? A group of what ________ is called a Paddling? In what country did the turkey originate? What was the name of the dog on the Cracker Jack�s box? Did Eve have a belly-button? How many ways can you give change for a dollar? What is the only fish that can blink with two eyes at the same time? Variation: You could make small groups and have them sit around you. Give one card to each group. Give them a moment or so to discuss the card and document their answer or response. Have each group pass their card over to the next group and repeat the scenario until all groups have had time to work on each card. When you are finished passing the cards around, give the answers (if there is an answer to each card) and allow the groups to see if their answers match-up with your answers. Do an activity that will create new, small teams and play Ponder Path again. Answers � e-mail me msgow@comcast.net. You remember the game of Marco Polo in the swimming pool don�t you? This game of tag is played the same in a marked off area of the floor or playing area. Make your boundary of the imaginary pool with rope or chalk first. Select a player to be the first tagger in the roped area. This player will be blindfolded and given a � swim noodle or � of a Fun Noodle. After this player is placed in the center of the area, the other players will move into the area silently. When all is ready, the tagger will say, Marco and the others will respond with Polo as in the swimming pool version of the game. Everyone tries to avoid being tagged by the noodle. All tags need to be made below the waist and there will be no running in this game � only power-walking or play it in �slow-motion.� When a player is tagged, they move out of the area and run a lap or two around the area before re-entering the game. Play for about 3 to five minutes per round. Don�t forget to count how many players were tagged. This will be the score for the tagger. Select another tagger and play again. Which tagger can get the most tags in that amount of time? Don�t forget to adjust your playing area for the number of players and age of your players. Something new from my brain today. I call it "4 Kick 6." Four players with 6 balls to kick They could be beach balls or tennis balls. The objective is for the group to keep all the balls moving at all times. This could be a timed initiative of a just for fun game. I like to have one group challenge another for the win. Split the groups away from each other so they don't get in each other's way. Blow the whistle and the fun begins. Tons of communication will instantly happen. Which group can keep all 6 of the items move longer than the other team? Here's another for your team building groups. I call it "Achilles' Heel Tag." This is like the old Stomp the Balloon party game. Give each player a handkerchief and ask them to tuck it into the back or side of their tennis shoe. Make sure the group is scattered out before play begins. On the signal to begin, all players try to stomp and dislodge other player's handkerchiefs. No player may stop at anytime. If they stop, they have to do 5 million Jumping Jacks! This is a great game of agility and observation. Kids of all ages like this one. It could also be a team challenge. One team on one end of the gym and the other on the other end. Say GO! Teams cross to the other side trying to stomp on the opponent's handkerchiefs and trying not to lose their own. Have them cross 5 times and then see which team has the most left. Texas Experiential Resources Assoc. / Conference March 29 to April 1st. Divide the group into � (inner circle) and � (outer circle) sub-groups. The inner circle participants stand with their backs together facing out. The outer circle participants form a circle facing the inner circle. Place one ball and one runner on the track between the two circles. Give the runner a 4 foot lead. The facilitator holds the ball and no one is allowed to get behind to push start it. On �Go� everyone starts pushing the ball towards runner with their hands as the runner tries to run away. If participant is fast enough and tags the ball, they win. If the ball �tags� them (or is just about to tag them), the ball wins. SAFETY: Do a test roll around with the ball to make sure the two circles are spaced far enough apart. All participants must only use their hands to propel ball forward. No kicking or pushing with feet as the runner could be tripped. Call �Tagged� before the runner is actually tagged by the Earthball to avoid the runner being flattened. Inner circle participants are often tempted to step out to see the ball coming but that could lead to collisions with runner. With two balls and two tarps, each team could compete to see which team could loft it in the air the highest. Divide the group into 2 teams, 6-8 people per team. Each pair will have a rope and stand across the field from each other (like jump rope) Pairs from team A will alternate with pairs from team B. The cage ball is rolled into the middle from the sidelines and the teams swing their respective ropes to �catch� the cage ball and toss it towards the opponent�s goal line. Each pair must remain in their areas (cannot run up and down the field) Once the ball is thrown past the goal line, a point is scored. SAFETY: Watch out for swinging ropes as they can catch an eye or whip someone. Also gloves may be advised if playing for extended periods to prevent blisters. This is a game from Lithuania and is best played with a large group of children. All that is needed is a medium-sized ball such as a kickball or a volleyball. All children stand in a circle and volley the ball across the circle. The ball must be hit with the hands and cannot touch the ground. When the ball touches the ground, as it inevitably will, the child who hit the ball last sits cross-legg...ed in the center of the circle. As more children sit in the middle of the circle, they must sit in a new circle facing the middle. The goal for the children in the middle of the circle is to intercept the ball, but they must stay seated facing the center of the circle. and the player whose volley was intercepted must sit in the center of the circle. The game can be played until children grow bored. The leisurely pace of Turkey Day can be challenging for small celebrants. Keep spirits high with this fun game. The dexterity test fills downtime between courses (and may have kids hunting for runaway game pieces). This little filler activity was taught to me by a Cherokee girl named /Sasa (Goose). Two players face each other and assume a thumb hold / grip. As the players say the chant, they touch each other�s shoulder on each syllable. The chant: This is a game of concentration � no repeat � no hesitation � and our category is�. If you are the player that says the last word of the chant, you choose a category then touch the shoulder of your opponent. This player will then say red then touch your shoulder. You say blue and then touch the other shoulder. This continues until a player either repeats a color or hesitates too long. The winning player departs to find a new challenge while the other player does 10 Jumping Jacks. In the old days, they used pebbles, or pieces from another game, go. Today, the pieces are usually made of glass. When playing, make a circle with your thumb and index finger (or middle finger), then flick one piece with your thumb. How to play: All players lay down the same number of ohajiki pieces on a flat surface, and then do jan-ken (rock, paper, scissors) to decide the order of play. The first person to take a turn gathers everyone's pieces, using one hand, and then scatters them on the surface.. The player then indicates two pieces, and draws an imaginary line between them to show how he or she intends to hit one with the other. f The player hits the piece as indicated, he or she keeps it. Otherwise, it is the next person's turn. At the end of the game, the person with the most pieces is the winner. Hanaichimonme is a group outdoor game. Divide the children into two equal groups. The two groups hold hands with the members of their own group. The two groups face one another. Each team picks a players they would like to "win" from the other group. Then, those two players play jan-ken-pon (better known to many of us as rock, paper, scissors). The loser leaves his team and joins the other team, while the winning team takes a step forward and sings out "We are happy we won this round"; the losing team takes a step backwards and sings "we hate to lose." The entire process is repeated until all of the players are in one group. I like to teach this game during Social Studies, when we talk about the early Native Americans. First, divide your class into two groups. Then, draw a line or form some sort of small boundary between the two groups. Next, tell the children that early Native Americans didn't have the toys that we do, so they had to find other ways to have fun. One way they had fun is to play the Eskimo laughing game. The rules of the game are that each side gets a turn. When it is your team�s turn, you may go you�re your opponent�s area and try to make them laugh. If you can make a player laugh, this player is now on your team. Allow about 1 minute for each round. Now it�s time for your opponents (the ones that are left) to come to your side and they will try to make your players laugh or smile. Play until one team has eliminated the other or give each team three tries each and then total the number of players per team. The team with the most players wins this funny game. Have participants partner with a member of the opposite gender, if possible (this game is described for a mixed-gender group - you will have to modify for an all-female group). Have participants form large circle in a male-female-male-female order. Have all male participants remove right shoe and place in the middle of the circle. Once the music starts participants weave in and out like in a square dance until the music stops. Once the music stops, female participants rush to the center and grab one shoe each. Once they have a shoe they must then find the owner of the shoe and place back onto their foot and sit on the floor. The last group to sit down is out. To continue, the males put their right shoes randomly back in the middle and start again. The last pair in the game are declared the winners once all other groups have been eliminated. People should get a different shoe every time to ensure that no one is cheating by getting the same shoe each round. Variations: This game can be adapted in many different ways. Participants could switch roles. Different articles of clothing can be used like mitts, jackets, etc. This is a lot of fun! You'll need a large rope and ten people. First, have two players with a smaller rope do the steps in the cat's cradle string game, and then mimic using the large rope and lots of players as the "fingers". See how far through the string game they can get! Cut open the corner of a bag of M&Ms and pour-out 3 to 5 M&Ms to each player. The players will then tell the others about themselves according to the colors they have been given. If you have a Red M&M = tell about your family. If you have a Green M&M = tell about your school. If you have a Blue M&M = tell something personal about yourself. Use the other colors and select other things to talk about. Have a snack and learn about each other at the same time. Make a circle of players and select one player to start in the central hula hoop. This player has an inflated balloon to use as the ball. The circle players will stand about 10 to 15 feet away from the hoop and facing the hoop. The central player will bop the balloon into the air, quickly run to touch one of the players (this player sits down), and back to catch the balloon before it hits the floor. The catch has to be made with both feet in the hoop. This process continues around the circle until all the players are sitting and the last balloon bop is caught. It is now time to touch 2 players (they sit) and get back in time to catch the balloon. Can a player make his/her way around the circle of players without any mistakes? Play continues by adding an additional touch each round. If a player can�t catch the balloon after touching the player/s and the balloon hits the floor, the next player takes his/her turn. Variation: When just learning the game, use chalk and draw a larger circle in the center. This will make the game a bit easier to start. To play this game, you needed a stick. To set up play, you first made a mark on the ground. Then you stood behind the mark and balanced a stick on your toe. The object was the toss the stick as high as you could and have it land on the mark. You got points for height and for accuracy. Have you played Ninja Slap or Ninja Ken yet? Make teams of five for this tag game. One player is selected the King or Queen to begin the game, three players are the Guards and the last player is the IT! The objective is for the IT to tag the King or Queen if possible in a given amount of time. The Guards must keep their hands on their hips at all times and the IT cannot touch the guards. If the IT touches a Guard, he will freeze, count to ten and then resume the attack. After a set amount of time, the group will select a new King or Queen, new Guards and a new IT to play again." Take a piece of construction paper and cut it into five pieces. Make several ahead of time or allow the campers or students to make their own. Each puzzle needs to have a different cut to challenge the players. Have your group sit in a circle to begin with. Each player has a puzzle in front of them. On the signal to begin, all players try to put their puzzle together as quickly as possible or allow the group 30 seconds to a minute to solve the puzzle. Once the time has elapsed or all the puzzles are together, have the player�s mix-up their puzzle pieces and pass them to the player on their right. The process begins once more on the signal to begin. Variation for Fitness: give each player s puzzle and have them sit on a start-line side-by-side. Place 5 cones in front of the group some 10 feet apart. On the �Go� signal, players quickly put their puzzles together. The first player finished will not have to exercise this round. The 2nd player finished will stand and jog around the 2nd cone and back to his/her original spot. The 3rd player finished will jog around the 3rd cone and back, etc. If a player can�t complete the puzzle in the allotted time, he/she will jog around the last cone and back. When they are beck in their original places, pass the puzzles to the right with the end puzzle going back to the other end. Play again. Suggestion: for younger students, mark the back side of the puzzle before play. It makes it a bit easier. Classic Game of "Hand Baseball." Great for Rainy Day Play or when traveling. "A Game 4 U" for many more games. Native American Indian Game of "Sticks." Click the above link for game page. A player is blindfolded and their teammates direct him/her to knock over as many specifically placed 2 liter plastic bottles in 30 seconds. Each team receives the number of points that the blindfolded player knocks down. Play continues until each player has had a turn. The points are added and the team with the most bottles knocked down is the winner. This is a test of quickness and it has been enjoyed by many for a long time. The activity is played by two players. One is holding a copper penny in his out-stretched hand, palm up. The other player is the Copperhead (snake) and will try to take the penny from the other player before he/she can close their fist around the coin. The Copperhead places his hand 8 to 12 inches above the out-stretched hand and waits for the precise moment to strike. The copperhead should have his hand with all fingers and thumb pointed down at the penny. The object is to strike the out-stretched hand with fingers and thumb around the penny and have it bounce up and into the grasp of the copperhead. This will take a bit of practice before the Copperhead can get the coin almost every time. The player with the penny cannot close his hand until the copperhead starts to strike. Let the Copperhead try 5 times to get the coin. He/she will receive 1 point for each successful attempt. Now, it is the other player�s turn to be the snake. Players sit round a table with their hands flat on the table top. The person who starts decides the direction of play and slaps their hands down on the table, one at a time. The next player follows immediately and play continues round the table. These variations can be introduced at any time: a double slap changes direction of play a triple slap means slap alternate hands only a quadruple slap means everyone has to stand, spin round and continue to play. Inevitably, the speed of play increases. Any hesitation or mistake incurs forfeits or lose of one hand. This is a simple but very contagious activity. I use a regular sized beach ball and work in groups of 8 to 10 players each. The objective is to keep the ball in play as long as possible as if playing �Hacky Sac.� Each player may strike the ball no more than three times before passing it to the next player. Have a group play for a while and see how many consecutive hits they can make. After each group is well adapted to the game, have them challenge each other like a tournament. They will really get into this activity from Viet Nam. Divide into groups of three, each picking a different bird sound such as "coo-coo," "tweet-tweet," or "chirp-chirp." One person conducts the band to the tune of a common song such as "Mary had a little lamb." As the conductor points to a group, they chirp or tweet to the tune in progress. It sounds crazy and young kids love it. Singing and conducting are equally fun. 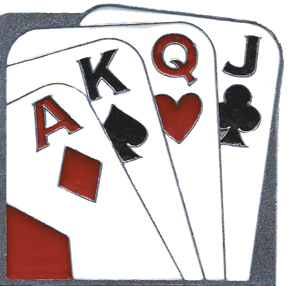 Players sit on chairs in a circle and are given the name of a suit of cards (Hearts, Clubs, Spades, and Diamonds). The Leader turns over the top card, the players of that suit move one chair to the left. If the chair is occupied they sit on that persons lap. If a suit is called and a player has someone on their lap both players move to the next chair. The objective is to be the first player to make it all the way around their circle and back to their original seat. This is a great party game so make sure you have a great prize for the winner/s. Two players are given the joker cards, the remaining players have a random card. The jokers tag the other players and remove their cards. After 1 minute, play is stopped, and the �jokers� add up how many cards the have. Change the �jokers�, re-distribute the cards and play again. The �joker� collecting the most cards wins.